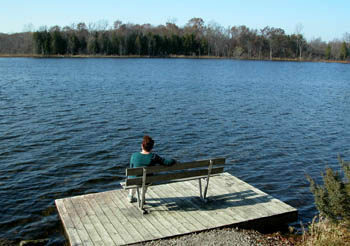 Independence Oaks County Park is the largest unit in the Oakland County Parks system at 1,286 acres, and a state-designated Wildlife Viewing Area. The park encompasses rolling hills, wooded ravines, the headwaters of the Clinton River, and a variety of wildlife including white-tailed deer. But the centerpiece is Crooked Lake, a 68-acre lake with crystal-clear water that is free from the buzz of motorboats and jet skis. 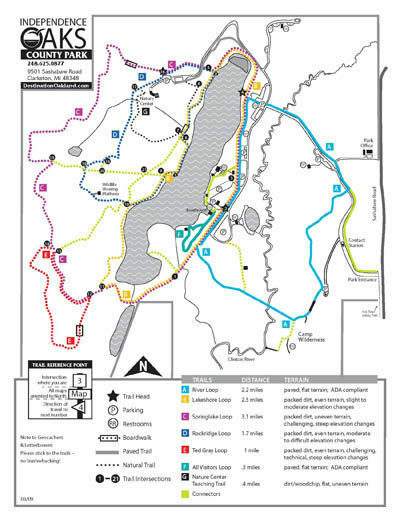 The park has a 14-mile network of trails with most of it in a rugged, undeveloped area on the west side of the lake. Here Springlake Loop, Ted Gray Loop and a portion of Lakeshore Loop can be combined to make a 3-mile loop that begins near the Lewis E. Wint Nature Center and leads you across the park’s highest ridges and along Crooked Lake. Cutting across the loop are several connector trails that allow you to shorten the hike. On the east side of the lake are the paved trails that are popular with inline skaters. 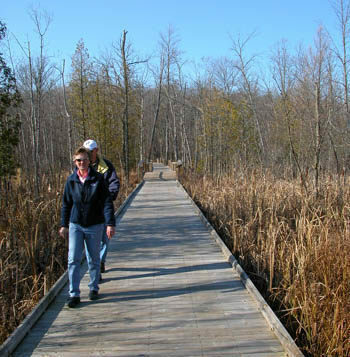 They include the River Loop, a paved 2.2-mile loop that includes a stretch through the Clinton River Flood Plain Natural Area, a wetland area, and the All-Visitors Loop that leads to an observation deck on Crooked Lake. ** A motor vehicle daily permit or an annual Oakland County Parks pass is required to enter the park by both county residents and non-residents.